Yeah, you want a six-pack, but a strong core doesn’t just make you look great. 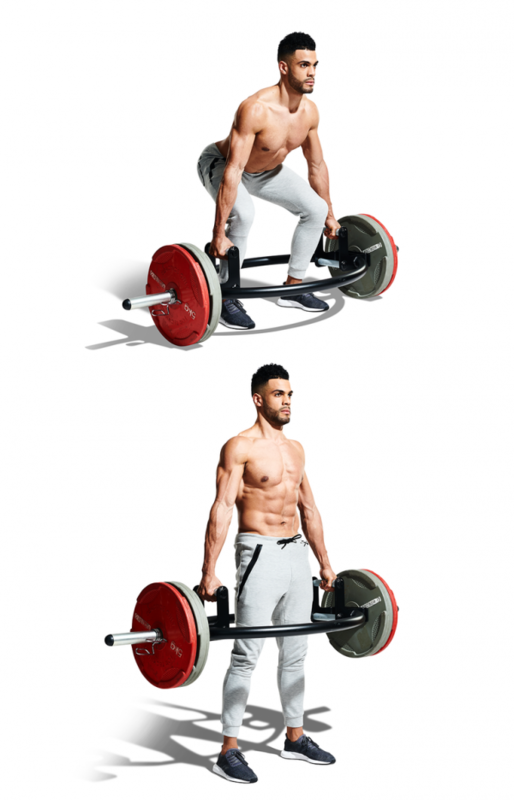 This workout blends three different specialities and it’ll challenge your abs to stabilise your body as you train other muscles too. Do this full-body workout 3 times a week, resting at least 1 day between sessions. If you’re new to the gym, this is all the fitness you’ll need for the entire month. You can also add these moves to your own workouts. Do these moves in order for 5 minutes, resting as needed, to fire up your glutes and core. Start on all fours, knees below hips and wrists under shoulders. Tighten your core and keep your hips parallel to the floor as you extend your left arm in front of you and straighten your right leg behind you. Hold, return to the start, and repeat on the other side. That’s 1 rep; do 8. Start in a left-side plank, right arm straight up in the air. Rotate your right arm down and slide it underneath your left armpit, twisting your torso. That’s 1 rep; do 10 per side. Start in a right-side plank, right knee on the floor. Tighten your core and use your hip muscles to raise your left leg as high as possible. That’s 1 rep; do 3 sets of 15 per side. Do the exercises in order. Rest 1 minute between each set. Hinge your hips, bending your knees as you lower your torso until you can grasp a trap bar loaded with moderate weight. Without letting your back round, brace your abs and stand. That’s 1 rep; do 3 sets of 8. Set up 2 equal-height boxes so you can place your feet on a box and your forearms on another. 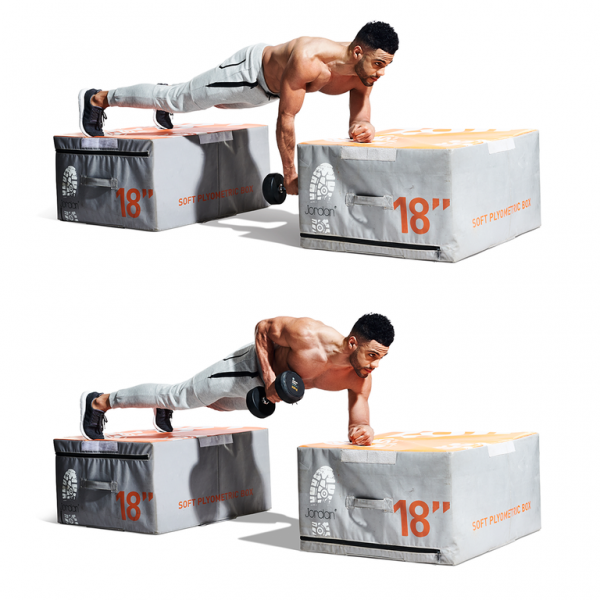 Get into forearm-plank position on the boxes with only your left forearm on the front box. Hold a medium-weight dumbbell in your right hand, arm hanging naturally. Keeping your hips level, row the dumbbell toward your right hip. That’s 1 rep; do 3 sets of 8 per side. Get in push-up position, your feet on a bench. Grasp a light dumbbell in your right hand. Rotate your torso until the dumbbell points toward the ceiling and your right arm is in line with your left. Pause, then return to the start, keeping your arm straight as you lower. That’s 1 rep; do 3 sets of 6 per side. Lie on a bench with only your shoulder blades, neck, and head supported, holding dumbbells over your chest, arms straight. Your feet should be hip-width apart, knees bent at 90 degrees, glutes tight. Bend your arms at the elbows and shoulders, lowering the dumbbells to your chest. Wrap up with a total-body move. Hold a heavy kettlebell (or dumbbell) in your right hand. Tighten your abs and oblique muscles so that the weight does not tilt your torso toward the right side. Walk 10 steps forward, then take 10 steps backward. Continue until time is up, resting only as needed.